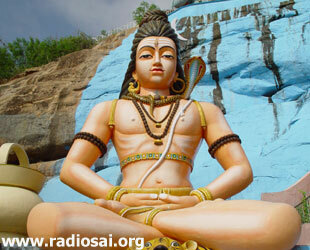 The Holy festival of Shivarathri, the night dedicated to Lord Shiva falls on the 26th of February. Here is a beautiful article explaining to us the Shiva-Shakthi aspect of Bhagavan Baba through various comparisons and parallelisms between Swami and Shiva. God is one. But the sages call Him by various names. The Divine comes down in human form in order to elevate the human, the crown of his creation, to the level of the Divine. Divine incarnations over the vast scale of Time are many: Avathaara Hi Asankheyaah, as the Vishnu Puraana states. Although each of the Avathaars possesses all divine powers, they exercise selective powers as appropriate to the specific periods, purposes and problems required to be tackled. We try to fathom the nature of a particular Avathaar by comparing and contrasting, and establishing similarities, equalities or congruences with an established Divine Personality in respect of their mutual characteristics, metaphysics or philosophy, powers, activities, appearances, including their names and their meanings; we then come to an inferential conclusion that the given divine manifestation or Avathaar closely approximates or resembles the primordial Divine principle or Form described in our ancient scriptures. Using the established criteria for such comparisons, twenty five elements or considerations are elaborated below pointing out that the Sathya Sai Avathaar closely resembles the Shiva principle. Hence the appropriateness of the ending of the Arathi (waving of lights) song with the expressions, Shiva-Sai-Mahaa-Deva. SHIVA'S BOON TO THE GREAT SAGE, BHARADVAAJA! 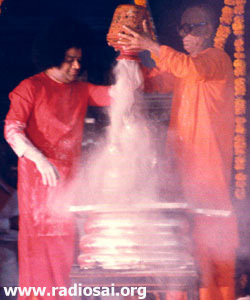 That Sathya Sai Baba is an incarnation of Shiva-Shakthi is attested by the Bharadhvaaja incident, when the great sage, visiting Kailash, (the abode of Lord Shiva) thought he was neglected by Shiva and Shakthi involved in their cosmic dance; later, Lord Shiva graced sage Bharadhvaaja with a boon that He would be born thrice successively in the Bharadhvaaja Gothra or lineage: first, Shiva alone as Shirdi Sai, then Shiva and Shakthi together as Sathya Sai, and Shakthi alone as Prema Sai. [For the complete story in Baba’s own words, please go here). The name SAAYEE itself means: Shiva-Shakthi. Etymologically, the first letter Sa(h) signifies the supreme Divinity (Eeshvara) or Shiva. Ayee, the second word signifies Shakthi, Ambaa or the universal Divine Mother. Baba has repeatedly declared the same, that His essential form is ShivaShakthi. 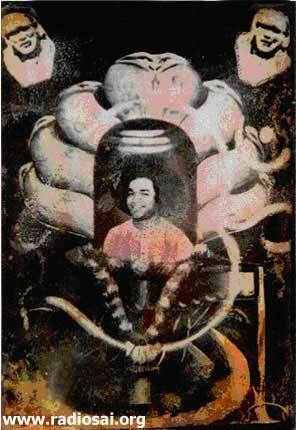 In an unusual interview Baba graced Shaasthreeji and myself (his son), Swaami created a tri-colour picture containing His bust in the middle of a Shiva Linga seated on the coils of a divine serpent, which covered the top of the Linga with its seven hoods (symbolic of the seven worlds or seven levels of consciousness). 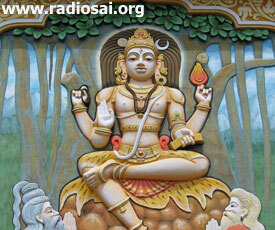 Swaami stated that this Saayeeshvara picture represented His "true form!" If the word Eesha (as Lord Shiva is commonly addressed) is reversed in its Sanskrith rendering, it becomes Shaayee, further reducing to Saayee or Sai, for short. Thus Swami's name as well as its meaning point in the direction of Shiva. Shiva is described in Namakam as short in stature and handsome in form: Namo Hrasvaayacha Vaamanaayacha. He is also praised as being eternally youthful. Namo Madhyamaayacha Apa Galbhaayacha. Baba can be described in similar terms of short stature and youthful and handsome in His divine demeanour! Short in stature but mighty in mind boggling miracles, as a U.N. diplomat in Delhi once stated: "How come! A five feet person draws five lakhs of people!" Shiva is described as Jataa Juutee, which means one with curly (matted) locks of hair. It is said in Rudhram: Namah Kapardhinecha Vyuptha-Keshaaya Cha "Prostrations to the Divine with (matted) curly hair and who is also clean shaven." Shiva's hair is described as completely black, Hari Keshaayopaveethine Pushtaanaam Pathaye Namah. 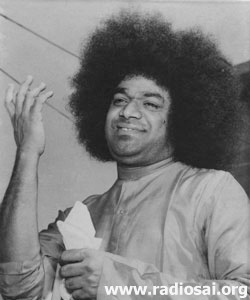 Similarly Baba's hair is also curly, bushy, and black, bearing striking resemblance with the description of Jataa Jutee. He is also clean shaven, "Vyuaptha Keshi", like Shiva. Shiva's form is described in the Vedhik hymn: Asau Yasthaamro Aruna Utha Babhrus-Sumangalah i.e., crimson, red and orange which are the early morning colours of the Sun. These are the colours of Baba's dress which is sometimes light red, sometimes deep red but almost always orange, the most auspicious colour. Shiva's body is adorned with holy ash resulting from the burning of all desires as represented by Manmatha; it also signifies the truth that ultimately, every thing is not only transient but reduced to mere ashes or dust at the end. Shiva is therefore called Kaamaari, the destroyer of lust and also as Bhasmoddhulitha Muurthi, a divinity covered with holy ash. Similarly, Sathya Sai who is bereft of any selfish desire used to be covered with holy ash, gushing out as a stream from his empty hands during the Mahaa Shivaraathri celebrations! It is well known that Baba creates at will, several times daily, in the view of thousands of people, undepleted amounts of holy ash by a mere wave of his empty hand. Like Shiva, Baba can be truly called a Vibhuuthi Sundhara (adorned by holy ash). Vibhuuti is the hall-mark of Shiva and so is Sathya Sai's. Vibhuuthi teaches us the lesson: "Dust we are and to dust we return." This Vairaagya Bhaava (feeling of renunciation) frees us from body oriented attachments. Baba draws to Himself devotees from all classes, castes, creeds, cultures, conditions, countries and from all types of people, just as Shiva whose devotees include both angelic as well as demonic persons. He is equally accessible to one and all, unlike Vishnu whom Dhevathas (angels) adore, but whom Raakshasas (demons) abhor. Lord Vishnu, in charge of maintaining the world, uses Dhanda - the big stick and massive weaponry to bring into proper track the wicked and the demonic. Baba is easily accessible and also easily pleased just as Shiva who is called Bhola Shankar. He is Sulabha Prasanna and Aashu-Thosha. Baba daily walks around the lines of devotees graciously accepting their letters; He reaches them Himself with materializations of sacred ash, Vibhuthi. He ministers individually to the needs and requirements of His devotees by loving grace of love-filled miracles. In the famous Vedhik hymn, Namakam or Shath Rudhreeyam, Shiva is adored as Kruthsna Veethaaya Dhaavathe Sathvanaam Pathaye Namah! "Salutations to Shiva who rushes to the help and to the rescue of the devotees." So does our Svaami, as attested by innumerable devotees from all over the wide world. 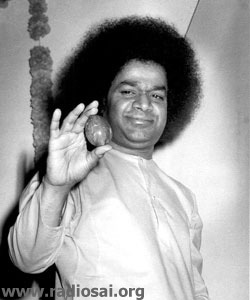 Just as Shiva is termed as Adhya Vochath, Adhivakhaa i.e., one who eloquently praises and vouchsafes for his devotees, Baba praises even a small "mustard-like" service rendered by them in terms of "pumpkin-size" encomiums! Shiva's first manifested form took the shape of a mighty egg shaped column of radiant effulgence, the Jyothirlinga which represents the primordial source, force and fulfillment of all Life. Linga symbolises the loving union of God and Nature, Purusha and Prakrithi, the basis of all creation which is pervaded by Divinity. During Mahaa Shivaraathri days, Baba used to materialise a variety of Lingas in His stomach and emit them from His divine mouth symbolising the cosmic creative act. He also creates Shiva Lingas of all types from his empty hand and gifts them to devotees. Furthermore, He has taken out the original Lingas underlying the idols in such holy places as Somnaath, Badharinaath etc, recharging them in the process and restoring them back to their original niches and pristine glory. Baba is truly a Lingodhbava-kara, because Shiva Lingas continue to emerge, as willed by Him, from His mere empty palm. On Mahaa Shivaraathri of 1961 Baba took out from his mouth the Aathma-Linga as a visible evidence of the Aathmik principle of Divinity, which inheres in all. During the 1974 Mahaa Shivaraathri festival, Svaami manifested a ten-inch long, Aathma Linga. He then made the astounding declaration that the sight of this AathmaLinga, which is described by KapilaMaharishi, (a great sage) would free one from the transmigratory cycle of births and deaths! That Linga assumed different colours every ten minutes! In regard to metaphysics, the Shiva oriented principle of "SHIVOHAM" and the SathyaSai teaching of Soham are non-dualistic, reflecting the Mahaa-Vaakyas: Thath Thvam Asi and Aham Brahmaasmi - (Thou Art That, and, I am the Divine). In Shiva worship, it is laid down that the worshiper must develop the feeling of one-ness with Shiva, Soham Bhaavenapuuyajeth. In the case of Vishnu it is near-blasphemy to say "VISHNOHAM"! Shiva is the primal preceptor in the form of DhakshinaaMurthi. He is the Lord in Kailash facing the southern direction, so the name Dhakshinaamurthi. He is the Lord of love and mercy, ‘Dhaakshinyam’ as it is said in Sanskrit. He teaches profound spiritual lessons by Chinmudhras or symbolic hand gestures, in which the right thumb (representing Paramaathma, the Supreme Self) closing with the index finger (i.e. Jeevaathma or individual self) indicates fullness or Puurnathvam. The other three outstretched fingers indicate the moving away of the worldly qualities of Sathva, Rajas and Thamas - goodness, passion and inertia. Through these divine hand-gestures Shiva, as Dhakshinaamuurthi boons the gift of Supreme Liberating Knowledge, ‘Jnaana Dhakshina’. Similarly, the bed-rock of Sai's teaching is Adhvaitha, non-dual equality of the individual and the Cosmic Self. Like Dhakshinaamuurthi, He is truly Adhvaitha Jnaana Bhaaskara, the Sun of the knowledge of supreme reality. Svaami's silent, creative and transformational activities are affected, as it were, by His Shanmudhras or six types of hand-gestures or circling movements of the hand and fingers. Simplicity and an austere bearing are the hallmarks of Shiva who is called Alankaara Varjitha meaning, free from ornamentation, unlike Lord Vishnu who is praised as AlankaaraPriya or the one pleased with decorations. In the entire Vedhik pantheon of deities, every deity except Shiva, are bedecked with ornaments, practically from head to toe. Shiva, although without ornaments, showers all rich ornaments on his devotees; Kubera, The Lord of Wealth, owes His proverbial wealth to Shiva. Similarly, Baba is simple and austere, does not even wear a watch, although He creates time-pieces at will! Like Shiva, He is truly Alamkaara Varjitha, bereft of ornaments, and also AhamkaaraVarjitha, with no trace of egotism. While Himself free from ornaments, Baba graciously materialises, day-in and day-out, jewellery, gold chains, lockets, wrist watches, icons of gold and precious stones for His devotees. He, like Shiva, is a divine jeweller showering Vibhuthi, Lingas and precious ornaments. These articles serve as talismans of protection from the ills of body, mind and ego. The adornments of Shiva are only natural entities, like the crescent moon radiating cool rays, the serpents round His neck and arms and the thousand-hooded Divine Serpent over His Linga (NaagaLinga) symbolising His mastery over the Mind (Moon) and the myriad senses (serpents). In the tri-colour picture created by Svaami for the Vedhik scholar Pandith G. Subrahmanya Shaasthry, the seven-headed divine serpent hovers over the Linga in the midst of which Baba's bust is manifested! Similarly, Baba's head is covered, according to Dr. Baranowski, an expert in Kirilian photography, by a large aura, a mass of shining bluish rays. (To read the article about Baba’s aura from our previous issue, go here). 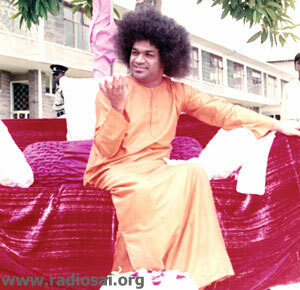 Devotees see visions of Baba as a moving column of effulgent light, radiating cool rays like the Moon! Like Shiva who is adored in the Vedha as Viruupebhyah Vishvaruupebhyah, Baba can take any form, assume different names appearing in several places, simultaneously. Baba, when He was young visited Viruupaaksha temple along with a party of relatives and the then Chairman of Bellary Municipality; it was vouchsafed that He was seen simultaneously inside the sanctum sanctorum of the Deity as well as under a tree outside the temple at one and the same time! Sai literature has numerous instances of Baba's simultaneous multiple appearances at far away places! Baba , like Shiva, is a Gangaa Dhaari, the bearer and giver of Ganga waters, Baba in His early teens used to being given by His mother, an oil bath on His birthdays. On one such occasion, Baba declared that there was no need for pouring any water over His head; and lo and behold! Water started flowing from the top of His head and spilled over the mother and an attending relative! Long afterwards in 1997, Baba gifted safe, piped drinking water supply to a million people in the parched Ananthapur district. He is truly a Gangaa Dhaari like Shiva who is associated closely with the life-supportive waters, as mentioned in several hymns of Namakam chants dedicated to Shiva. Shiva is called Jala Muurthi, the life-supportive water-form. This is extensively hinted in the holy Vedhik hymn of Rudhram or Namakam. Salutations to that Divinity which is closely associated with lakes, rivers, wells, reservoirs, and water falls. Once I told Baba that hydrologists are sceptical of the long-term viability of water supply to the proposed Sathya Sai Water Project in the dry Ananthapur district and that the abiding solution is the inter-basin water transfer from the far-away Godhaavari River. Baba then made the astounding declaration that He guarantees water supply to the project for many centuries provided the water pipe-lines are built strong enough to last that long! In any case, the Godhaavari originates in Thryambakeshavara and He pointed to His heart as the true place of origin of these waters! When Svaami was in his early twenties, a restless youth who was an incorrigible cricket fan, was given the task of attending to Baba. Baba was reeling out cricket scores of a match being played in far away Madras in order to keep the youth happy! Even then, the boy kept asking questions of Svaami, particularly about the third eye of Shiva. Svaami looked intensely at the young man, when a jet stream of Vibhuuthi shot out with gale force from the middle space of the eye-brows of Svaami suchwise, that the youth was catapulted to the other end of the hall! The story is narrated in "Man of Miracles" and also reconfirmed to me recently by the then youth, now in his early sixties. Shiva is adored as Thryambaka the three eyed as in the famous hymn of liberation "Thryambakam Yajaa Mahe", and so is Sai Baba a Thrayambaka the three-eyed one with his Jnaana Nethra, the third eye of wisdom, always open. Shiva is worshipped in the Shatha Rudhreeya Hymn as being Prathamo Dhaivyo Bhishak as the primordial divine doctor. In the same Vedhik text Shiva is adored as Vishva Bheshaje, Vishvaaha Bheshajee, Shivaa Rudhrasya Bheshajee. He is the expert physician curing all the ills. Another hymn praises Him as the Lord and Master of the world of Medicines, Bhuvanthave Vaarivaskruthaava Oshadheenaam Pathaye Namah. Like Shiva, Baba is the doctor of doctors, effecting innumerable cures of many illnesses of the Body, Mind, the Intellect and the Ego as well by his mere divine touch; Svaami materialises Vibhuuthi with curative properties, as well as actual medicinal tablets; He performed miraculous surgeries, including the materialisation of the necessary surgical implements as asserted, confirmed and reconfirmed, particularly in Howard Murphet's writings. Shiva as Dhakshinamuurthi, is a complete celibate, teaching by silence the non-dualistic unity of Jeevaathma with Paramaathma. He is surrounded by the eternal celibates: Sanaka, Sanandha, Sanath-Kumaara and Sanaathana, the four mind-born sons of the creator Brahma. Thus Shiva is called Brahma-Charyaashrama Priya (fond of celibacy). Similarly, Svaami is a complete celibate, Brahmachaaari, who is in constant integrated Braahmik consciousness, teaching non-dualism all His life. He is also surrounded by the student Brahmachaaris, that is why he is called Brahmachaari Pariveshtitha. Svaami repeatedly declares that His only property is His students. Shiva is the Lord of Yogis, Yogeeshvara; while Vishnu (Krishna) is the Lord of the Yogas, Yogeshvara (vide the 18 yogas in the Bhagavath Geetha). 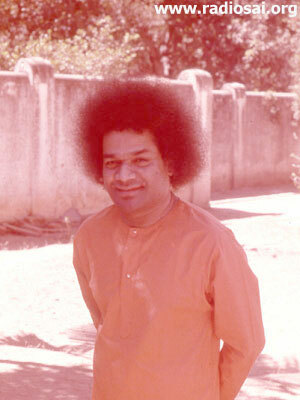 Sathya Sai is Yogijanapriya, meaning the darling and nourisher of the Yogis. He closely instructs, guides and sustains them to achieve perfection as in the case of the Yogic practitioners in the Narayana Guha, (a small cave in the Himalayas ) to whom He gifted a vessel producing food and drink whenever needed! Shiva is seated on a tiger skin, Vyaaghra Charmaaaseena, suggestive of the control of cruel animalistic qualities. Svaami, in Prashaanthi Mandhir, is daily seated on a chair underneath of which is a tiger headed skin. In his wandering youth days, Svaami's only luggage piece was a tiger skin (with a pair of towels)! Shiva is an ascetic, a renunciate, a Mahaa Viraagi and dedicated to Loka Sangraha, the welfare of the worlds (e.g. He swallowed deadly poison and saved the world). Svaami, likewise, is supremely detached within and intensely active without and performs loving selfless service, through free educational, medical, humanitarian relief activities, such as provision of drinking water supply to lakhs of people. He tirelessly teaches Sai Shadvarga, that is, the six human values of truth, righteousness, peace, love, non-violence and selfless service/sacrifice for Lokasangraha in order to counteract the poison of Arishadvarga, the six inner enemies of Lust, Anger, Greed, Attachment, Pride and Jealousy. Svaami like Shiva is universal, transcends caste, class, creed, country, culture etc. He is beyond all orders and categories; He is truly an Athya Aashramee, like Shiva. He teaches universality: "There is only one Race, the race of humanity; only one Religion, the religion of love; only one Language, the language of the heart and only one God and He is omnipresent!" For each aspect of Shiva, there is a symbolic Yanthra or numerical (and geometrical) representation. In the case of Shiva, the Absolute, it is number nine. Letter "Shi" in the science of Manthras is signified by the number of five and the letter "va" equals number four, making a total of nine. Eeashvara connected with creation is signified by number eight. And an Avathaar is signified by number seven, which is the hall mark of Shiva Shakthi. Sai is Sapthamayee, with seven fold powers, principles, and purposes. We realise that Sai is Eeshvara i.e., Shiva. May That Almighty, All in-All personality, lead us to liberation. Similarly, for each manifestation of Shiva, there is a Thanthra, a schema of adoration, worship and prayer. In the case of Shiva, the adoration is through the chanting of the Shatha Rudhreeyam; the worship is done by pouring water over the holy Linga, called Abhishekam, and the prayer is contained in the Vedhik hymn of Chamakam. In the case of Sathya Sai, there are similar forms of adoration, worship and prayer: Sathya Sai Gaayathree chanting, Sai Ashtothara NaamaPuuja (chanting 108 names of Sai)and Aarathi with the waving of lights. The Aarathi song is addressed to Shiva-SaiMahaa-Dhevaa! And finally comes the distribution of Vibhuuthi, which is the hall-mark of both Shiva and Sai, the-visible manifestation of Shiva Thathva being the non-dualistic principle of "Soham" (Sah + Aham = I am Divinity): Sai Shivoham. That is Truth, Goodness and Beauty. In conclusion, we meditate on SAI SHIVOHAM, the five lettered, non-dualistic Panchaakshari Manthra. It signifies oneness of Shiva, Sai, and our Self; this is in contrast to the dualistic manthras of Namasshivaaya. 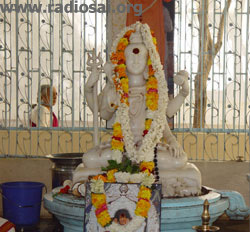 SAISHIVOHAM means that this Sathya Sai is the visible living manifestation of the unitary Shiva principle of the identity of Jeevathma and Paramaathma, that is, of the individual Self with the Supreme Self; this is the teaching of both Shiva and Sai and also the supreme teaching of Adhvaitha Vedhaantha taught in the Upanishaths, India ’s most ancient scriptures.